David, Diana, Derek, Debbie and Donald looked the same. They were special. They were quintuplets. All five of them were born at the same time. David, Derek and Donald wore pants and Debbie and Diana wore skirts. To tell them apart, their mama always dressed them in different colors. David always wore a red vest. Diana always wore a purple vest. Derek's was yellow, Debbie's was pink and Donald's was green. 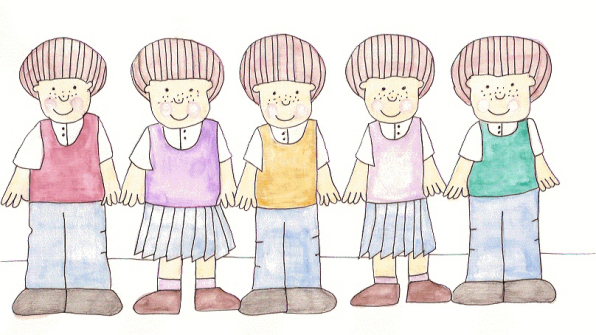 One morning the quintuplets wanted to play a trick on their mama. David put on Derek's yellow vest. Derek put on Don's green vest and Donald put on David's red vest. Diana and Debbie switched vests too. They ran to the breakfast table and sat in each other's chairs. Mama fixed them scrambled eggs and toast and she didn't know they'd changed places. When Mama brushed their hair she called them the wrong names. Later that day when Mama called them in from playing outside, she called them the wrong names again. They told their mama what they'd done. After she dried them off with a towel, she told them to go and get in their pajamas and climb into bed. Mama came through to give them a good night kiss. “Are you really David?” She looked at the boy in the red pajamas. He smiled and nodded. She kissed his cheek and pulled the covers around him. “Are you really Diana?” She bent over to hug the girl in the purple pajamas. Diana nodded. Mama kissed her on the cheek. “Are you really Derek?” Mama hugged her son in the yellow pajamas. He nodded and she kissed him goodnight. Mama gazed at the girl in the pink pajamas. “You're really Debbie, aren't you?” Debbie nodded and hugged her mama. David, Diana, Derek, Debbie and Donald laughed. “We won't, Mama.” But they knew that they'd do it again another time, when Mama least expected it.